In the last few decades, Europe has warmed not only faster than the global average, but also faster than expected from anthropogenic greenhouse gas increases (van Oldenborgh et al., 2009). With the warming, Europe experienced record-breaking heat waves and extreme temperatures, such as the 2003 European heatwave, 2010 Russian heatwave, and 2015 European heatwave, which imposed disastrous impacts on individuals and society. Illustrated in Figure 1 are time series of the area averaged summer (June to August, JJA) surface air temperature (SAT), and summer or annual temperature extreme anomalies over Western Europe relative to the climatology. One of most important features is the abrupt surface warming since the mid-1990s and rapid increases in temperature extremes. The changes in SAT and temperature extremes during the recent 16 years (1996-2011) relative to the early period 1964-1993 are more than 1.0 degrees Celsius (degC). Figure 1. Time series of summer (JJA) or annual mean anomalies relative to the climatology (mean of the whole period) averaged over Western Europe (35oN-70oN, 10oW-40oE). (a) Surface Air Temperature (SAT, degrees Celsius),Tmax, Tmin, and Daily Temperature Range (DTR, degC), (b) annual hottest day temperature (TXx) and warmest night temperature (TNx) (degC), TXx and TNx based on two data sets of HadEX2 and E-OBS are shown. Black and red range bars indicate the earlier period of 1964–1993 and the recent period of 1996–2011. What has caused the rapid summer warming and increases in high temperature extremes over Western Europe? Relative to an early period of 1964-93, sea surface temperatures (SSTs) have warmed, particularly in the North Atlantic and Indian Oceans, and sea ice extent (SIE) has decreased. Due to air quality legislation, anthropogenic aerosol (AAer) precursor emissions in Europe and North America have decreased since the 1980s and greenhouse gas (GHG) concentrations have increased. In order to understand the relative importance of these forcing factors on the rapid Western European summer warming and increases in hot temperature extremes, a series of numerical experiments with the atmospheric component of a state of the art global climate model have been performed in a study by Dong et al (2016). 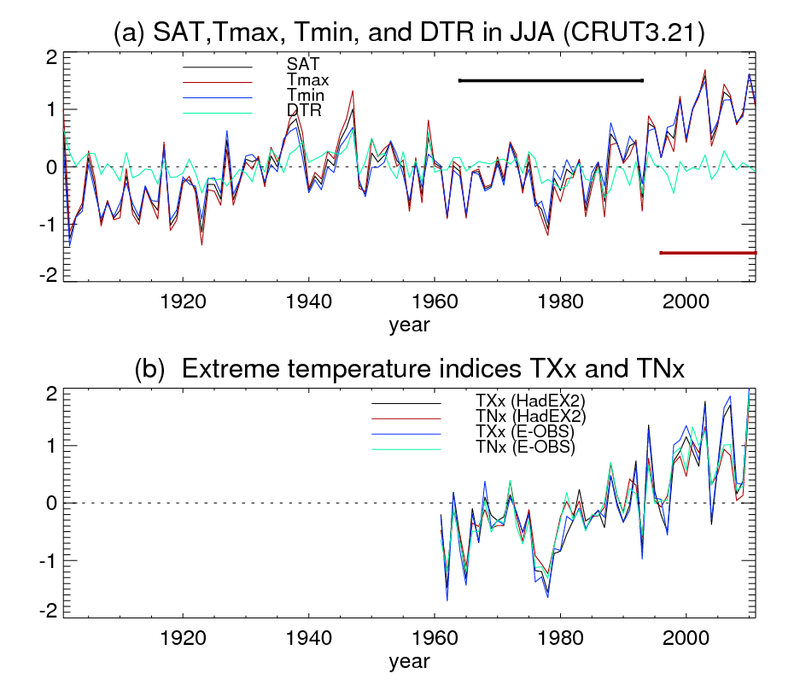 Some area averaged summer or annual changes in temperature extreme indices over Western Europe between two periods for both observations and model simulations are illustrated in Figure 2. There is good agreement between the model forced by changes in all forcings and observed changes in summer seasonal mean SAT, Tmax, and Tmin. In response to changes in all forcings, the model simulates an area-averaged summer mean SAT change of 1.16 ± 0.21 degC over Western Europe, which is very close to observed change of 0.93 degC. The changes in SST/SIE explain 62.2 ± 13.0% of the area-averaged SAT signal, with the 37.8 ± 13.6% explained by the direct impact of changes in GHGs and AAer. Both changes in SST/SIE and AAer lead to an increase in Tmax, while the increase in Tmin is predominantly due to the change in SST/SIE. The direct impact of AAer changes act to increase Daily Temperature Range (DTR), but change in DTR is countered by the impact of GHG forcing. However, DTR change in response to all forcings is overestimated by the model. Results also suggest that the direct impact of AAer changes plays an important role in the increase in the annual hottest day temperature (TXx) (explaining 45.5 ± 17.6% of the signal in the response to changes in all forcings) while the increase in the annual warmest night temperature (TNx) is mainly mediated through the warming of the ocean. Figure 2: Observed and model simulated summer seasonal mean (JJA) changes between two periods for SAT, Tmax, Tmin, and DTR, the annual changes in annual hottest day (TXx) and warmest night (TNx) temperature, averaged over Western Europe. SAT, Tmax, Tmin, DTR, TXx, and TNx are in degC. 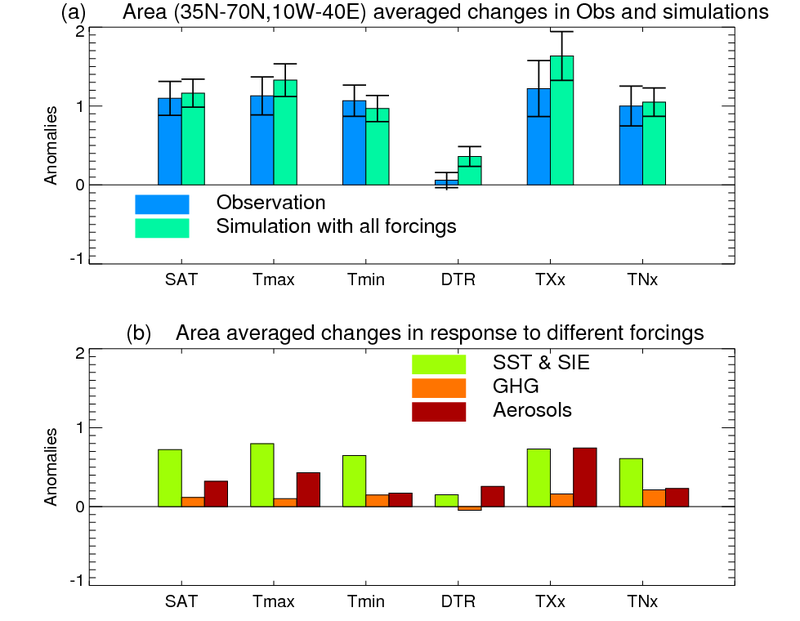 (a) Observed changes (based on CRUTS3.2 and HadEX2) data sets, and simulated responses to changes in SST/SIE, GHG concentrations, and AAer precursor emissions. The coloured bars indicated the central estimates and the whiskers show the 90% confidence intervals based on a two tailed Student t-test. (b) Model simulated changes in response to different forcings. SST & SIE is the response to changes in SST/SIE. GHG is the response to GHG concentrations, and Aerosols is the response to changes in AAer precursor emissions. Whilst each forcing factor causes summer mean surface warming and associated temperature extreme changes over Western Europe, the physical processes are distinct in each case. For example, SST/SIE changes lead to more or less uniform summer mean warming at the surface. In contrast, changes in AAer lead to a band of surface warming and temperature extreme changes in latitude of 40oN-55oN. The results in this study illustrate the important role of the direct impact of changes in AAer, not only on summer mean temperature but also on temperature extremes. Reduction of AAer precursor emissions not only induces increased downward solar radiation through aerosol-radiation and aerosol-cloud interactions, but also induces local positive feedbacks between surface warming and reduced cloud cover, reduced precipitation, soil moisture, and evaporation. Looking forward in the next few decades, greenhouse gas concentrations will continue to rise and anthropogenic aerosol precursor emissions over Europe and North America will continue to decline. Our results suggest that the changes in seasonal mean SAT and temperature extremes over Western Europe since the mid-1990s are most likely to be sustained or amplified in the near term, unless other factors intervene. Post originally appeared at the ‘Weather & Climate’ blog. One of the interesting aspects of global warming pointed out by Manabe, is that with increasing global mean temperature, temperature variability decreases. Two physical processes ( reduced pole to equator gradient and increased capacity of the atmosphere to resolve energy imbalances by latent heat transfer ) can explain this, though most assessments remain from GCM runs. This came to mind, when I looked at Christy’s testimony about extreme high temperatures decreasing over the US for more than a century. I found a similar result. Unfortunately, the record outside the US is not nearly as dense, consistent, nor persistent as within the US. But when I considered a briefer period, similar to the one above( 1962 through 2011) of consistent and persistent non-US stations, I too found an increase in hot days. However, when considering the consistent and persistent stations since 1905 outside the US, the period since 1962 also indicated an increase of hot days – but this was part of a longer term decrease of hot days since 1905. I considered US temperatures as part of a spectrum of winter and summer frequencies. There is decrease in frequency of both high and low extreme temperatures during both winter and summer. Now, the IPCC idealizes future temperature change considering variations of increased mean temperature and increased temperature variability. But perhaps they should include the possibility of (figure x.) decreased variability ( especially given the model results indicating decreased variability ). If temperature variability decreases by a lot compared to the increase of the mean ( as is implied by the US since 1905 ), then fewer extreme high temperatures are expected. If the temperature variability decrease is comparatively small, then extreme high temperatures are expected to increase, though still with a decrease of the very most extreme high temperatures. Nice article in which I miss every hint to the AMO as part of the internal variability which influences the JJA- Temps of Western Europe as stated one of the co-authors of the referenced study, see http://atoc.colorado.edu/~whan/ATOC4800_5000/Materials/Sutton_Hudson_2005.pdf .